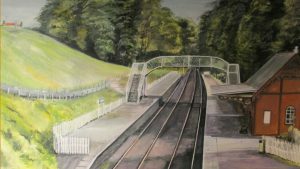 In 2015 the Society Council agreed that Birkhill would be upgraded as a signalled passing station, a development which will transform both the operational capabilities of the railway and the station itself. The S&T Department has already commenced some of the work needed by erecting 5 signals. The development needs to be done in phases due to the B&KRs running seasons. In Autumn of 2016 the SRPS established an Appeal to generate support to bring the development in to reality. Work commenced in June 2017 with the cutting out and laying of the initial foundations and construction of the platform retaining wall. During the course of 2018 the footbridge foundations where dug and concrete pour, the old footbridge from West Calder station was recovered and moved to a local fabrication company’s yard where it has gone through a full restoration including sandblasting, patching, priming and final painting and was finally delivered to the Bo’ness yard December 2018. Work has now recommenced up at Birkhill on the final preparations of the foundations which includes the concreting in of the foundation bolts whilst back at Bo’ness the completion of the column repairs (filling painting etc) is underway ready for a potential install at Birkhill in April ’19.